The Sarah Jade is a high speed crew and cargo movement vessel designed for oil & gas production and exploration offshore. She was built in 2001 and feature an optimised deck cargo carrying area and an all-aluminium hull designed for the comfort of passengers. 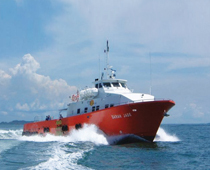 The vessel comes with a 59 m2 cargo deck area and 35 tons deck cargo capacity and can reach a top speed of 20 knots. The Sarah Jade is fully air-conditioned and can accommodate 80 passengers.